On December 10, I’m presenting a paper at the first annual Indiana University Department of Theatre and Drama Graduate Symposium on Theatre and Performance Studies. The theme of this year’s symposium is “War Making Bodies” and is presented in conjunction with IU’s Fall Themester, “Making War, Making Peace.” I’m looking forward to the conference, and it also will be interesting to see how others have visualized the “War Making Bodies” theme in their own work. 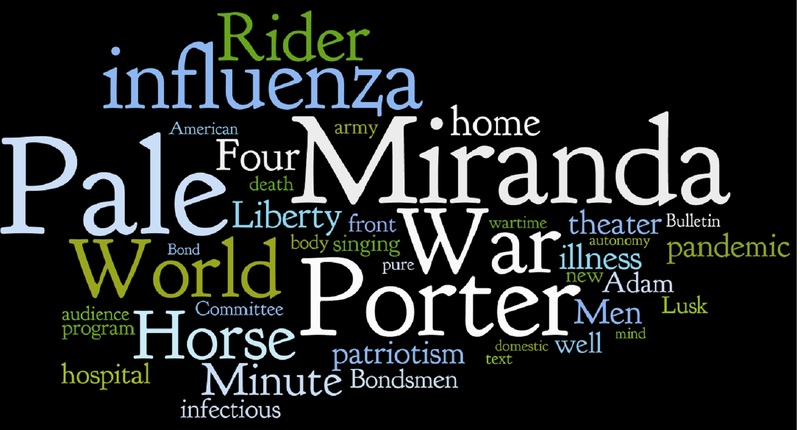 “Pale Horse, Pale Rider” wordle displaying common words from a portion of my dissertation’s last chapter. All rights reserved. I’m calling my presentation “‘A Singing Army Cannot Be Beaten’: Four Minute Speakers in Song, a Historical and Literary Perspective.” I look at Katherine Anne Porter’s representation of Four Minute Men in the vignette “Pale Horse, Pale Rider,” which concludes the short novel of the same name. A national program, the Four Minute Men began in September 1917 as a propaganda campaign in which volunteer orators educated Americans about World War I initiatives, such as conscription and the Liberty Bond. In the program’s most well-known incarnation, Four Minute Men speakers addressed movie theater patrons during the four minute intermission, or the time it took to change movie reels. Interestingly, not quite a year after the program’s inception, speakers were urged to lead theater-goers in patriotic song during their four-minute presentations. For the most part, the addition of group singing to the Four Minute Men speeches has gone unnoticed by historians (see here and here, for instance). However, Porter’s “Pale Horse, Pale Rider” pays a great deal of attention to this aspect of the program, and I find this disconnect intriguing. My conference presentation derives from a portion of my dissertation’s last chapter, which is entitled “Pandemic Infleunza and Infectious Patriotism in Katherine Anne Porter’s ‘Pale Horse, Pale Rider. '” In this part of my dissertation, I analyze Porter’s portrait of a Four Minute Man (and his audience) in song, but the constraints of my project, as a whole, don’t allow me to explore the topic in depth. The conference paper provides a nice space to do just that. Finally, the image above is a wordle of a portion of the chapter, and it lists the 50 most-used words. (Note that common words like “the,” “also,” and “however” aren’t included). What have you wordled? Share your wordle (or a link to it) with me below. Warning: Wordle is addicting. ‹ What is an “American” Horror Story?